In a neglected grave in Tewkesbury Cemetery, deprived by the overhanging branches of a tree of a view of the Abbey he loved, lies one of the most important men of Victorian Tewkesbury - Thomas Collins. Collins was born to humble parents, John and Elizabeth Collins, who were members of the Wesleyan Methodist Chapel, despite which Thomas was baptised in the Abbey on 14th. October 18181, and so began a lifelong association with the Abbey. He attended the British School in Barton Road (now Elizabeth Wyatt House), where he said that he learnt to write in sand2 in the absence of pen and paper. In 1823 he witnessed the laying of the foundation stones of the Mythe Bridge, having been carried there from town on his father's shoulders3. Little could he have thought that many years later he would lead the campaign to free the bridge from toll charges. Sundays for the young Thomas were dominated by attendance at the Wesleyan Sunday School, He must have proved an able pupil, since in 1816 he was appointed a Sunday School teacher. At the age of 21, Thomas married Honor Luker in the Abbey, for the Wesleyan Chapel was not then licensed for the solemnisation of marriages. The newly-weds set up home in a cottage in Back of Avon. Thomas was obviously a good Sunday School teacher, for in 1849 he was appointed Superintendent, a post he was to hold for over thirty years. To undertake this duty his love of children must have been very strong, and it must have been a personal tragedy for Thomas and Honor when both their children died young; Elizabeth in December 1847, aged only 19 months, and Catherine in December 1864 in her eleventh year. By 1851 Thomas and Honor had moved into the house in Church Street, with his parents, which was to be their home for the rest of their lives. Thomas's marriage to Honor lasted until her death in 1889, when, to quote his words, "a cloud of gloom passed over my house at that time"5. Collins' father was a stocking maker, but he must have realised that the trade had little future in Tewkesbury, since he arranged for Thomas to be apprenticed to a stonemason. Although the documents of the apprenticeship have not survived, it is probable that he was trained by a member of the Collins family, who had been bricklayers and masons in the town for many years. His apprenticeship was completed by 1841, for the census returns for that year describe him as a journeyman stonemason, i.e., in the period of several years before he was able to practise as a master mason. In 1842 he went into business on his own account and employed one other man. Little is known about his early work, but by 1851 the census returns describe him as a stonemason employing four men. He was clearly a good craftsman, gradually establishing his reputation. His work came to the attention of the eminent Victorian architect, Sir Matthew Digby Wyatt, who was secretary to the Royal Commission for the Great Exhibition of 1851. Two years after the exhibition, when the Crystal Palace was moved from Hyde Park to Sydenham Hill, Wyatt commissioned Collins to provide copies of Abbot Wakeman's tomb and twenty bosses from Tewkesbury Abbey6, which were to be incorporated in the permanent exhibition. At about the time that Collins was undertaking this work, Wyatt was collaborating with George Gilbert Scott on the design of the Foreign Office in whitehall. Scott was to feature greatly in Collins' later career. The Crimean War ended in 1856 to great rejoicing throughout the nation. In common with many other towns, Tewkesbury obtained one of the guns captured at Sevastopol, but having got the gun, controversy raged over where the gun should be displayed in the town. At first it was suggested that it should be located in the arch between the chapels in the newly-opened cemetery in Gloucester Road, but permission was refused by the Burial Board. The Town Council asked Collins to design a plinth for the gun to be located at the Cross7. Unfortunately his design did not find favour, and the Town Council eventually accepted an offer by Henry Barnes, the contractor for the construction of the Upper Lode Lock, to provide a pedestal at no expense to the town8. This was one of the few rebuffs that Collins received in his business life. The gun was subsequently moved at least twice, before being scrapped during the Second World War. Collins soon bounced back from this setback, when in 1857 the Town Council decided to enclose-the open space in front of the Town Hall to form a Corn Exchange. Collins was employed to produce the stone building which we see today, one of only two stone frontages in Tewkesbury High Street. By this time the volume of work undertaken was such that Collins felt the need of partners, and so he joined with William Cullis, a bricklayer who originated from Pershore. Cullis had been in business on his own account in Tewkesbury for some years, and, like Collins, he was a member of the Wesleyan Chapel and a Sunday School teacher. For a short time a third partner was brought into the company, W.H.James of Cirencester. The partnership traded under the name of Collins, Cullis and James. The firm renovated the Saxon church at Deerhurst in 18629, and in the same year built a new chapel at Overbury. Commenting on the completion of the latter contract, the Tewkesbury Register said, "The present place is quite an ornament to the village and reflects great credit upon the taste and energy of Messrs. Collins, Cullis & James of Tewkesbury, who we feel assured will be losers by the undertaking. "10 The business was expanding rapidly, so that by 1861 Collins described himself in the census as a "Builder, employing 64 men and 6 boys" They were good employers; in 1864 all three partners were invited to dine at the Fleece Inn by their workmen, and were presented with specially made clocks11. James left the partnership in April 186512 after the completion of the major contract for the building of the Borough Flour Mills for the Healing family. Collins' long association with the restoration and improvement of Tewkesbury Abbey began in 1860 when he was employed to install a new window in the east end. The work was under the direction of George Gilbert Scott. On the completion of this work, the Tewkesbury Register observed that "the performance of the works was placed in the hands of Mr. Thomas Collins of this town, and we need hardly say that it has been executed most satisfactorily, as is every undertaking he has"13. At about the same time, Collins was starting on one of his other contributions to the street scene of Tewkesbury, the restoration of the medieval buildings. In an attempt to make old properties look more modem, many of the timber and brick frontages had been covered with plaster or rough cast facades. Collins recognised the craftsmanship which had gone into the original structures, and he decided to return them to their former glory whenever an opportunity arose. His first restoration was of Warwick House in Church Street. His workmanship was unfortunately destroyed by fire during the 1980's, but, thanks to the conservation policy of Tewkesbury Borough Council, has once again been restored. He next set about revealing the wonderful Elizabethan framing of his own home, Cross House on the comer of Church Street and Tolsey Lane. Other properties restored by Collins during a long career included the Bell Hotel, the Wheatsheaf, Dobells (the Victoria Wine shop) and probably the oldest house in the town, the Berkeley Arms. It is fair to say that most of the credit for the survival and good condition of so many black and white buildings in the town is due to Thomas Collins. Restoration of the Abbey had been talked of for many years. During earlier attempts at restoration much of the stonework had been painted, and the nave was a mass of irregular pews and galleries. The walls were 'streaming with moisture' and there was a 'continuous damp and musty atmosphere which pervaded the whole building'. 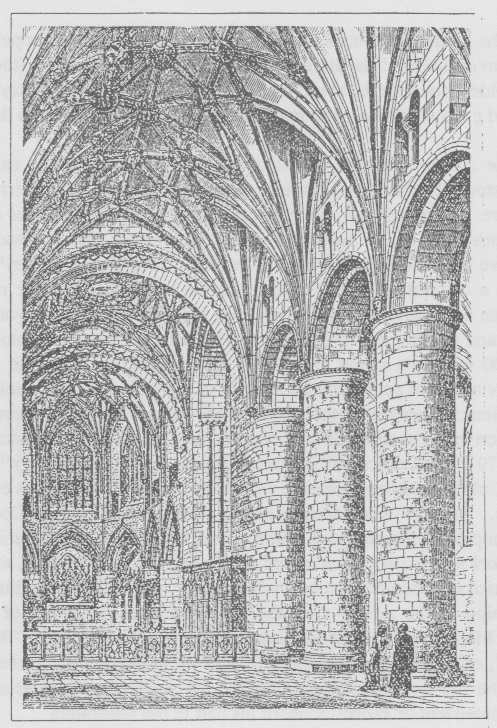 In 1864 a public meeting was held at which George Gilbert Scott gave his vision of what should be done to restore the Abbey14. This meeting led to the formation of a committee to raise funds for the restoration. After receiving Scott's estimate of the cost of the necessary work the Committee resolved not to start work until they had the necessary funds in hand to complete Scott's plans. The not inconsiderable sum of was needed. The first £4,000 was soon raised, but it was not until 1870-71 that the real impetus for restoration was started by an act of generosity on the part of Collins. Bearing in mind that he was a Wesleyan, and in fact Senior Steward of the Tewkesbury Circuit of the Wesleyans, his offer to undertake some restoration in the choir at his own expense was all the more remarkable. His part in the restoration of 1875-79 is well described in Anthea Jones' book Tewkesbury15 The value of the work carried out by Collins at his own expense will never be known, but it was considerable over a period of thirty years. 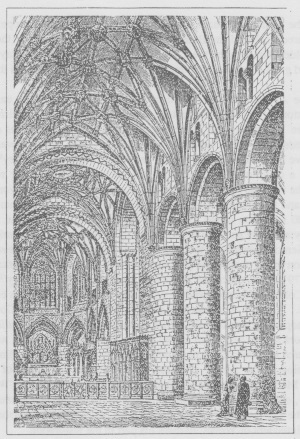 In 1877 at a meeting of the National Restoration Committee held at Lambeth Palace the Bishop of Gloucester said, "Our contractor, Mr. Thomas Collins, will, we fear, be a great loser by the work he has performed in and for the sake of the old Abbey, which has no part in the contract and in which his liberality has had no bounds" 16 Speaking at the dinner held in 1879 to celebrate the re-opening of the Abbey after the restoration, the Treasurer of the Restoration Committee, Charles W. Moore, said that he had asked Collins time after time, "What claims have you on the Committee?" , only to receive the reply, "I have no claim on the Committee, I am doing this myself" 17. Whilst he did not seek recognition for his work, the Freemasons made Collins 'Provincial Grand Superintendent of Works' to mark his part in the restoration. Meanwhile, Collins' building business was gaining a considerable local and national reputation. In 1870 he built the Roman Catholic Church at the Mythe18 (now converted into September Cottages), and the Primitive Methodist Chapel in Barton Street19 (now a store for the Hospital). He was also carrying out extensive restoration work at Worcester Cathedral under the direction of George Gilbert Scott20. The 1871 Census reported that Collins was a "Builder employing 311 hands". The Rural Hospital in Oldbury Road (now Graham Court) was built by him in 1871, this was a cause he supported for the rest of his life. The Wesleyans were using the chapel which they had opened in 1814 in Tolsey Lane21 (now the Tewkesbury Antiques Centre), but by the 1870's were looking for a better site on which to build new and more convenient premises. In 1872 Collins and Cullis took the opportunity to buy the Borough Market House which was located at the Cross22. Initially the partnership used the building as a timber store, but Collins' real intention was to use the site for a new Wesleyan Chapel. In his capacity as Circuit Steward, he became Chairman of a fund-raising committee for this purpose. In 1874 the partners sold the Market House to the Wesleyan Trustees, and in 1877-78 were the contractors for the clearance of the site and the erection of the Methodist Church which we see today on a prime site in the centre of the town. Three years later Collins built the schoolroom at the back of the church and repaired the adjacent house in Church Street, for use as the Wesleyan Manse23. The chapel contains a stained glass window given by Collins, which is dedicated to his grandfather, Samuel Collins, and family. Collins' generosity to the Wesleyan cause was as liberal as it was to the Abbey. The account books of the chapel record many donations from him to make up deficits in the quarterly accounts24. If money was needed for any purpose, Collins could be relied upon to be the first contributor. In 1877 Collins' partner, William Cullis, decided that he wanted to branch out on his own and bought a building business based in Hereford. Once again Collins was directing the Company on his own. The break in the partnership had little or no effect in the success of the business, since Collins' reputation for quality work was well known. 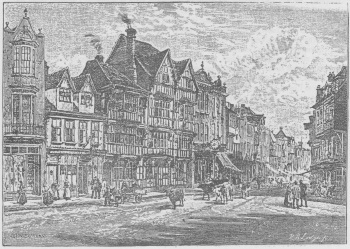 Restoration or new building work was undertaken in places as far away from Tewkesbury as London, Manchester and Brecon. Whilst building and restoring churches, of all denominations, was the backbone of the business, Collins also built hospitals, schools and large country houses. The expansion of the business was such that in 1881 the census returns report that Collins was a "Builder employing 400 men". He was the major employer of labour in Tewkesbury, and, at a time when poverty was common, many families in the town were justifiably proud of, and grateful to, Collins for the prosperity he brought. He was not a man to exploit his workmen, but was concerned for their welfare. As early as 1865, the Collins and Cullis Workman's Mutual Benefit Society was formed. This Society provided financial help to workmen who fell sick, and death benefits for the men and their families. The social side of life was also catered for; football and cricket clubs were formed and played on land in Oldbury owned by Collins. 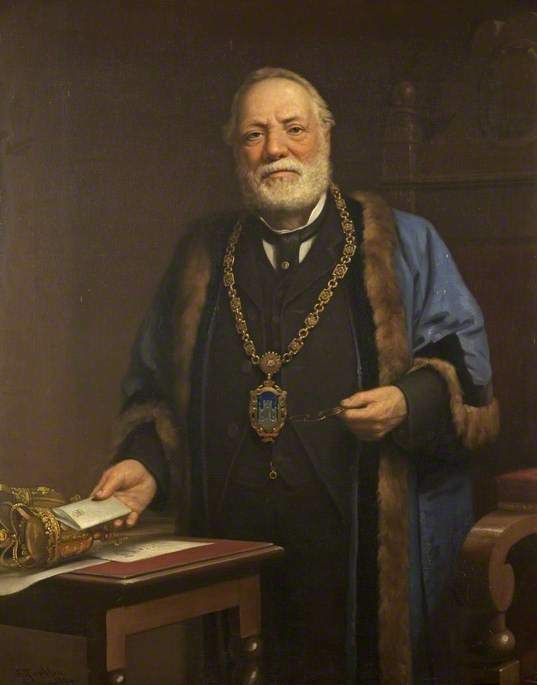 Collins encouraged thrift, and he was one of the first directors of the Tewkesbury and District Permanent Benefit Building Society, which was founded in 1882. One of Collins' favourite causes was the British School where he had received his education. By 1881 the school had outgrown its premises, and the trustees were fortunate in securing a plot of land on the opposite side of Barton Road. Needless to say, it was to Collins that they turned to erect a new classroom (now the Tewkesbury Youth Centre)26. At the time of the dissolution of the monasteries by Henry VIII, the Abbey House, Gatehouse and land surrounding the Abbey were separated from Church ownership: Since 1820, the Abbey Estate had been in the ownership of the Martin family (of Martin's Bank), but on the death of Richard Biddulph Martin, the estate was offered for sale by auction in July 1883. The Restoration Committee saw this as an opportunity to reunite the estate with the Abbey, and so further enhance the standing of the Abbey. The Committee had no money to bid at the auction and launched a national appeal, backed by the Society of Antiquaries, Because this appeal would take time to raise money, Collins joined forces with the Vicar of Tewkesbury, Canon Robeson, in bidding for the estate at the sale which took place at the Swan Hotel. They were successful in outbidding other interested parties, but had to pay £10,500. Collins and Robeson held the property until funds could be found27. This act on their part enabled the Abbey House to become the home of the Vicar, as it is to this day. Not all the land in the estate was passed to the Abbey; some, notably the Vineyards, was retained by Canon Robeson. Collins was now in his mid-sixties, a time of life when most men look forward to scaling down their activities and enjoying an easier life. But Collins was not an ordinary man; he was a man of remarkable energy and public spirit. In 1885 he embarked upon a new phase in his life which was to bring him local honours. The story of this new turn in his life will be told in the next article.